image from page 2 of Sales Clipper, Vol. 20, No. 7, July 1962. Caption reads: "Jet Age Facility: Setting for Jet Clipper is Honolulu's new International Airport, scheduled to open this month. Pan Am jets make 125 take-offs and landings a week there." image from page 12 of Sales Clipper, Vol. 20, No. 5, May 1962. 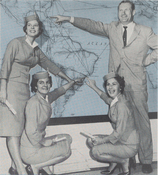 Caption reads: "Alaskan Service: West Coast advertising supports Pan Am's Alaskan service with this route network." Photograph of a fashion model posing in front of Pan Am's new terminal at Idlewild (JFK) Airport for a tv presentation in 1960.
image from page 5 of Sales Clipper, Vol. 18, No. 10, Oct. 1960. 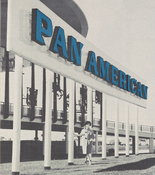 Caption reads: "Model Terminal: High fashion model poses outside Pan Am's new idlewild terminal. This is one of the photos used in the TV presentation." Image from page 1 of Sales Clipper, Vol. 17, No. 8, Aug. 1959. Caption reads: "Newest Cargo Clipper: This is a model of the new Cargo Clipper 207 which Pan Am will use to inaugurate its volume cargo program."